It looks like Bucciarati has been stealing plays from the Jotaro Kujo play book. Coincidentally, he’s fast becoming a member of my “not a jojo who might as well be a jojo” appreciation club after the conclusion of this little two parter. 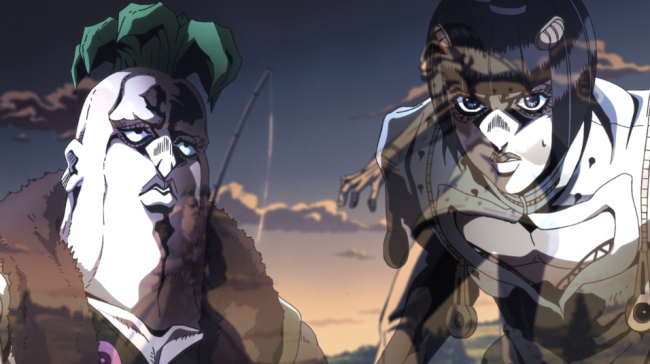 After throwing himself from the “120 km speeding train” along with Prosciutto at the climax of the previous episode, it seemed like Bucciarati’s act of sacrifice would save Trish and his crew. However, thanks to some uncharacteristically quick thinking, giant thumb headed man manages to catch both of them on the outside of the train with his fishing rod stand.